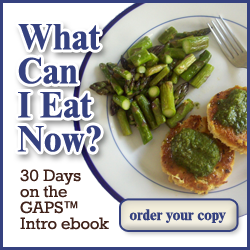 The first time we did the GAPS diet intro, it was a big learning curve. We’d never fermented vegetables or dairy and we weren’t in the habit of making stock. Most importantly, I had a bad attitude. Frankly, I had texture issues with soft foods and was very resistant to the idea of eating a low fiber diet with my history of constipation. I was also afraid I couldn’t get full on just soup. This time around, we’re all set up for GAPS, and it’s super easy! I know all my past objections are moot. GAPS Intro is actually a satisfying way to eat, and it makes me feel so much better. I just grab a jar of stock from the fridge or freezer (or scoop some out of a pot in progress), chop up some veggies, and add some meat. When it’s ready, I add a bit of a probiotic food. It takes 25 minutes to make my meals. If I need to go somewhere, I just heat up my soup and put it in a thermos. For variety, I use different vegetable and ferment combinations, and alternate the textures of my soups from brothy, to more stew-like, to pureed. It also helped that we already had all the stuff we needed to do a bunch of home cooking! Homemade bone and meat or fish stock. The soft tissues, meat, marrow, and fat cooked while making the stock. Non-fibrous vegetables, cooked in the stock until soft. The juice of fermented vegetables, added to the stock when eating. For people who are prone to diarrhea and who pass the sensitivity test, dairy based ferments. Ginger, mint, or chamomile tea with a little honey. For all the details and reasoning behind it, read pages 142-148 of the book Gut and Psychology Syndrome, Revised and Expanded Edition by Dr. Natasha Campbell-McBride. Stock is a traditional healing food, and is ridiculously easy to make. You can either do it on the stovetop in a heavy stock pot, or in a crock pot. You start with bones and joints (with marrow and soft tissues still on them, and large tubular bones cut by the butcher) or a cleaned, whole fish, chicken, pheasant, etc. Then you put your bones or animal in your pot and cover it with water. You can add some unrefined, uniodized salt to taste. You cover it and simmer for a few hours, or if using a crockpot, cook overnight. Then you strain out the bones and meat. You can freeze (use wide-mouth jars with no neck and leave headspace!) or refrigerate your stock, and then reheat it later on the stove top (not the microwave). Take all the meat, marrow, and soft tissues and save it to add to the soups you make later. The more stock you have on hand, the better. Just keep it going all the time and you’ll never have to worry about running out. When you make your stock, you strain out the bones, meat, marrow, and soft tissues. Pull out the bones, and save the rest in the refrigerator. Then you can add these to the stock when you are making soup. The GAPS diet avoids starchy vegetables such as potatoes. Other vegetables, such as carrots, leeks, squash (winter and summer), broccoli, cauliflower, etc can be added to the soup. At this stage, make sure to avoid brocolli stems and other fibrous parts of the vegetables. Add your stock, vegetables, and the meats you saved and bring it to a gentle boil for about 25 minutes, or until your vegetables are soft. You can puree the soup if you like. A stick blender works well for that. The brine of fermented vegetables, added to the stock when eating. Fermented vegetables are a naturally probiotic food. Since introducing probiotics can unpleasant reactions as the balance of flora in your gut adjusts to them, it’s important to start slowly. Start by adding a total of 1-2 teaspoons a day of the juice from the fermented veggies to your stock and soups. Gradually increase the amount each day until you can tolerate a few teaspoons of the probiotic food in each cup of soup or stock. Always take care to let your soup cool a bit before adding the fermented vegetable juice – you don’t want to kill the good bacteria before you get a chance to eat them up! We’ve got lots of fermented vegetables and their juices on hand at the moment – sauerkraut, asparagus, cucumber, and green beans. If you are just getting started with fermenting vegetables, the easiest thing to start with is homemade sauerkraut. If you really don’t have it in you to make your own, Bubbies makes a live sauerkraut that you can buy in the refrigerated section of the grocery store. If you have an existing dairy allergy, of course consult your doctor before trying to introduce any dairy products. The sensitivity test that Dr. Natasha recommends is to take a bit of the new food and place it on the inside of the wrist before bed. Let it dry there overnight. In the morning, check the spot for any reaction. If there is a reaction, retest again in a few weeks. Do not introduce a food that shows a reaction. Some people find that while they have problems with processed dairy, homemade fermented dairy is well tolerated. We use raw milk from a local farmer and make yogurt from it. We also make kefir from raw milk. The kids and TinyHands eat the kefir – I can’t stand it. In Stage 1 of the GAPS Intro, whey drippings from the yogurt and sour cream made from yogurt culture are recommended if constipation isn’t an issue and the sensitivity test shows no reaction. These ferments are probiotic, like the fermented vegetables. They should also be introduced very slowly, working up to about 1/2 cup a day. To make ginger tea, just grate some ginger root and add boiling water. Don’t use powdered versions! Let it steep for 3-5 minutes, then add a little honey (raw and local is best). Make sure you have the things you’ll need for stage 2 on hand. For example, you may want to start fermenting your fish and find a good source of fresh eggs now. Full disclosure – the fermented fish never turned into a thing we did. GAPS still helped us immensely! This post is part of the Probiotic Food Challenge, Monday Mania and Simple Lives Thursday, Sunday School, This Week’s Cravings, Monday Mania. I have been told I need to be on Gaps. It seems insane. Everything is very difficult, if not impossible. It would be easier to be on a juice fast. I feel luck punching someone, but dont have the energy. I’m sorry you’re having a hard time, Robert. Who told you that you need GAPS? If you decide to try it, you don’t have to start with the intro. You can slowly incorporate each aspect of the staples of the diet first, then phase the other stuff out. A lot of people find that approach is more manageable. This is a way of life and eating that does take a lot of commitment and a real, deep down desire to try it. Have you read the book? For us, understanding how it had such a potential to help us made it possible. It took us a year of considering it to get there, though! Hi, can you tell me what evidence I’m looking for to know when to move onto the next stage? I can’t get my 18 month old to just drink broth & my 3 year old only drinks a little when creatively bribed. I don’t want to move into the full diet with all of our guts not properly taken care of first. Thanks so much for your help! Not being a medical professional and also not being able to meet your kids personally, I really can’t give any specific advice about whether or not they are ready for the next stage. In the GAPS Intro Stage 2 post I summarize a bit of what Dr. Natasha says about moving between the stages in her book. For kids who will not eat the foods at first, Dr. Natasha does recommend allowing other foods. She also advocates the ABA method of feeding, which uses rewards for eating the GAPS foods. I personally don’t agree with that strategy for most kids. I prefer to sneak the broth in. Will your kids eat vegetables that have been cooked in broth? Will they eat very thick pureed soup? You can make the soups more like a stew, and then gradually increase the amount of broth. Coconut oil & honey can be mixed up and given to help prevent hypoglycemia if the kids really don’t eat. It’s also ok to “back into” intro. Dr. Natasha advocates that as a good approach. Basically, you start with the full diet and go through the stages backwards! In that approach, you start by incorporating the basics of GAPS, and then cut out grains, starches, and refined sugar. Do you know why the fermented veggie juice needs to be added to the soup as opposed to having solo? I don’t recall that there was an explanation for that. I think it’s ok to have solo. It does make the soup taste super yummy, though. I’ll have to reread that section of the book. Do make sure to let your soup cool before adding the ferment juice to it, though, so as not to kill off the beneficial bacteria. You’re so right about the veggie juice making the soup taste better. I started adding my homemade kimchi to pureed soups and couldn’t believe how wonderful it tasted. Thanks for this post! I have been really worried about starting on GAPS because nearly everyone says how hard it is!! Thanks for being so positive!! You’re welcome, Faith! GAPS has been such a positive force in our lives. It isn’t always easy, but it’s definitely doable. When in doubt, make a quick soup. It’s really not so hard! Whether to move on is really a personal decision. In the GAPS Stage 2 post I talk about it a little bit. You will not necessarily get any digestive problems. Usually, the sign to move on is when digestive problems resolve. I wouldn’t introduce a whole lot of new foods or supplements all at once, but would probably go ahead and start stage 2 if I were in your shoes. If you start to notice die-off reactions, then you know you’ve introduced enough/too much of the probiotics. Of course if you are unsure or dealing with other symptoms you may want to consult your health care practitioner. For stage 1, can we have bone broth? I believe meat stock is different, I am just not sure how. Also, in bone broth you are suppose to add vinegar to leach the minerals out of the bones. Can we do that on stage one? Also, would you happen to know when I can add in coconut oil? Dr. Natasha uses the terms “meat stock” and “bone broth” which is a bit confusing because traditionally, culinary use of those words is the other way around. Broth is traditionally a clear liquid made by simmering meat (and bones, and possibly veggies & herbs as well) for a short period of time. Stock is traditionally made by simmering the bones (and possibly veggies and herbs) for a much longer time. It gets more out of the bones and cartilage and will gel nicely. In the book, in stage one she talks about using the bones, joints, and soft tissues more than the muscle meats, and simmering them for around 3 hours at least (or overnight in the slow-cooker). You can add a splash of apple cider vinegar and that does help get more out of the bones. In her recipes on page 179 she says: “the longer you cook the meat and bones, the more they will ‘give out’ to the stock and the more nourishing the stock will be.” Don’t forget you can make soups in stage one by including non-starchy vegetables that you cook thoroughly in your stock or broth. Thanks so much! You have such a knack for explaing GAPS. I just love your blog, and I have bookmarked the intro stages as a reference. I have all of NCM’s books and even The Gaps Guide, but somehow they don’t compute as well as I need them too. You have helped to bridge the gap. Thanks again! I was interested in when to introduce coconut oil, because I suspect I do not handle it as well as I should. When I have the oil my skin breaks out. I can’t say that I have notice this is the coconut milk at all. This is all pre-GAPS though. in* the coconut milk. Oops! Hi Stacy! I have to start off by saying that I’m not a medical professional and can’t give any medical advice – I can only tell you our experience. It can take the bowels a little time to adjust to not eating so much fiber. Without all that extra bulk, the bowels can have a harder time moving things along. Sometimes carrot juice or homemade sour cream can help. In the Gut and Psychology Syndrome book, Dr. Campbell-McBride recommends enemas to relieve constipation. She has a whole section devoted to giving enemas to children. It’s been awhile… I’ve popped over before from the celiac.com message board. I’ve made an impromptu decision to start the GAPS intro today – I’ve been feeling rough, and decided it’s time to start feeling better! My kids are away at their dad’s and I decided it was a good time to try the intro. So, a quick question for you: My freezer is already loaded with stock (I’ve cooked lots of chickens, made stock, and frozen it for future use…). Yesterday, I was at a health food store and they were selling frozen individual organic chicken breasts. I picked one up because I thought it would be a quick/easy supper since it’s just me here. I defrosted it overnight. I’m wondering… if I want to add it to the soup I’m making, what’s the best way to cook the chicken breast? Can I just boil it in some water? You can freeze stock in glass, but you must use jars that don’t have a neck. You can buy jars specifically for freezing on Amazon. As for the sauerkraut, we keep it in the fridge and eat it later. In intro, you can start adding in the fermented vegetables in Stage 3. Hopefully you’ll be able to get there before it goes bad. Adding some water (or salted water) to the kraut is fine. I just started gaps, how long am I supposed to do the intro before I move onto stage 1? Hello good people 🙂 been reading all you have written on GAPS and just finished making my first beef stock. Took all the bone marrow in a bowl along with all that was stuck to the bones from the butcher. As the stock is cooling off i see that there is a 1/2 inch layer of fat lying on top of the bowl.. and the marrow with the tears is in another bowl.. cold as well and immersed in fat. Some stock turns out more fatty than other batches because of the bones that you use. We like to cool the stock then skim off the fat if there is a lot. You’ll probably be able to tolerate more of the fat in pureed soups than in plain broth based soups. We save the fat that we skim off and refrigerate it for cooking vegetables in later. Beef fat will coat your mouth as it cools, so use it in things you will eat hot! Thank you. Thank you. Thank you. I am so glad to find a clearly laid out guide for going ahead with the GAPS diet. Im especially pleased to see you included directions for a fish broth as well, since im currently allergic to beef/chicken and some types of fish. Im hoping to finally end my multiple food allergies with this diet. I’m going to start the GAPS diet ASAP, and have found your website very helpful!! I’m very new to cooking (occasional cakes from scratch, but mostly microwave food), and have no idea how to get the meat off the chicken after cooked. I’ve been a vegetarian for the past 10 years, so it will gross me out at first, and I’m on the autism spectrum (sensory issues). To prevent a meltdown, I need to know exactly what I’m doing and exactly what to expect. Do you have or know of any videos that show how to take the meat off, and do whatever else to the chicken after the stock has been made? Or do you know what keywords I can type into google in order to find a video myself? “Debone marrow poultry” ?? The fewer surprises, the better off I’ll be! Mama, Thanks for the blog. I have started my daughter on GAPS intro, but the stock I have made is nasty tasting! Really. I did exactly what she said in the book, but it is really awfully boring and not tasty at all. Can you help me with how to get the fat out of it or something? that seems to be the problem…too much fat even after I cooled it and took hard fat off the top. The beef stock is especially creepy. Thanks. Fat is good for you! But truth be told, my kids hate it, too. I find that it can help to cook carrots or squash into the soup and then puree it. Since it’s already a “creamy” soup at that point, you don’t notice the fat as much. Stock should have a good flavor. You can add bay leaf, salt, and pepper. You can also add ingredients like carrots and celery which will sweeten it up, but do NOT include the tops, as they can go bitter. Do not cook your stock with brassicas as it will give it a weird flavor. If it is very bland, you may need to cook it down further. After you have removed the bones and meat, let it boil so it becomes more concentrated. If it tastes scorched, you have cooked it too long, or let the bones come uncovered. This can happen in the crock pot. Make sure the bones are totally submerged. Thanks for your help. One more quick question: what is brassicas? No problem 🙂 Brassicas are things like cabbage, kale, broccoli, collards, etc. They’re good in soup, but I add them closer to the last minute, not while making the stock. Wow I wish I had found u sooner. I paid for an intro diet guide bc I was so lost. This is much clearer and straight forward as far as what to expect and how to do it. I’m glad I have the guide I bought bc its so thorough, but I feel like I’m looking at a mountain I have to climb and I’m all alone. I have a 2 and almost 4 year old. 4 y/o has autism. Feeding him has been a nightmare. I know we need 2 do this but transitioning into this has been expensive and overwhelming. I really appreciate the help you have put here. Thank you! This was very helpful! I wanted to ask, i started the gaps today (did not have a full week to prep, a little rash move to get my inflammation down in my gut due to crohns, prescribed by my GI)… that being said, I wanted to see if you could clarify my understanding of how to consume the food. I have to have a cup of broth with every meal (in it, 1 tsp, up to 2 of the liquid from fermented cabbage) and along side it i can have my boiled chicken or the approved veggies that are boiled in the broth till softened. That being said, say I make a soup with my broth and blend in my veggies, does that still count as my one cup of broth for that meal? Last question, is there a limitation to how much of those veggies and boiled meat I can eat during the phase one of the gaps, or i can eat as much as I want? Good luck. You can eat your broth with your veggies and meat as soup if you like, and eat as much as you want. Don’t put your kraut juice in the broth when it is very hot. If it is cool you can combine them. It will probably feel like you are eating a ton, since it takes more volume of food to get your caloric needs met when you cut grains! I am confused about adding the fermented veg juice to the hot stock, won’t this kill the beneficial bacteria? Right. Don’t add kraut juice to hot soup. Let it cool first if you want to mix it. Thanks for clarifying that, I’ve been reading the GAPS book and she suggests mixing the juice in with the bone broth, do you know what a safe temperature would be be? Hi , my 4 yrs old son is on stage 1. Is it ok to give home made coconut milk as beverage? Coconut milk is not one of the items allowed as part of stage one. I just started the GAPS diet today, but I’m alittle confused about how long we’re supposed to stay in each stage. Where does she talk about that in her book? I must have missed it. The book says that it is individual to each person. Most people look for signs of digestion (and other symptoms) normalizing before moving on to the next stage. It took our family about 6 months to go through intro, but many people do it much more quickly. Make sure that on stage 1 you are getting enough veggies and meat so that you have energy and don’t become hypoglycemic. Stage one is NOT just broth. I highly recommend actually reading the book to get more perspective on it. Thanks Mama. We started first stage for my son from a week now. Since then he started constipation issue( not too sever). Like the stool is hard and sometimes held every alternate day. Some of the write ups on the internet says, start giving 2nd stage food alongwith first stage food if constipation issue occurs. What is your thought on it? My son is not allergic to any food and having no issue of constipation for last 2 yrs. He was having constipation issue at the age of 2. Hi , in 2nd stage, do we need to remove the skin of squash, before making soup. We are removing skin of butternut, green and spageti squash. But for yellow squash and zuchhini, we are keeping the skin. Is that right?